During my father's generation, toys were made of Tin instead of plastic. It come in different shapes and sizes. With a simple wind-up mechanism, it transform into an action toy fascinating children of that generation. As plastic came along, tin toys became collectibles. 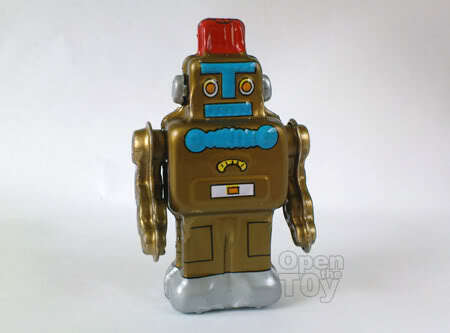 I am fortunate to get a piece of history in my toy collection and here is my Tin wind-up robot. The robot design is one of the popular design during the birth of the science fiction era. The LEDs faces, block outline, meter on his chest are all signature of a robot design. 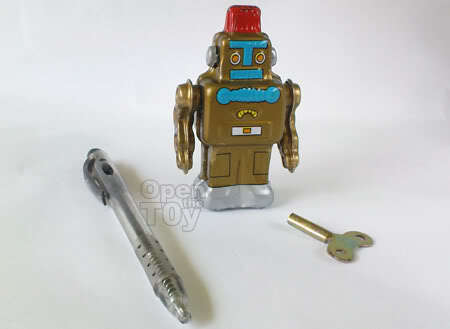 The size of my Robot toy however is not any taller than a size of a regular pen. The robot comes with movable hands and a wind-up gadget on his side. All you need to do is to insert the key, wind it up and he is ready to go. This classic robot toy comes in 3 different colors. Red, Blue and Gold. I had one of these many years ago. (Similar). But it got all rusted (Yes, It rust!) and it went with the trash. Ya rather old school but it's classic! Yes it will rust if the keeping condition is not idea. Rule of the thumb, no contact with water and keep in dry places away from moisture. Leon, this one is older than the ancient toys that I have..Haha!! Having a special key to wind up the toy is really cool! Seems that you have a diverse collection of toys. Great work for the video too!